Book Your Holiday on the French Mediterranean! bedrooms 3 + 1 studio . Lovely house to rent in the beachside town of Ste. Marie la Mer Plage, on the Mediterranean coast close to Perpignan. 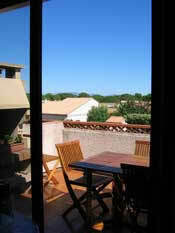 The house is located on a quiet "impasse", less than five minutes' walk from the sandy beaches. The house has three stories, each approx. 40m2, with a roof terrace on the top floor.On the ground floor there is a separate studio and a back yard with southern exposure. The first floor (approx. 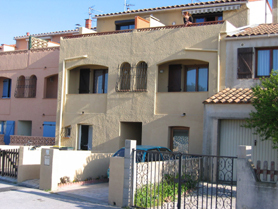 40 m2) has three bedrooms: 1 with a double bed and double doors onto a loggia / balcony at the front of the house; 1 bedroom with 2 single beds; and a small bedroom with a single bed.There is a bathroom and a washing machine. On the top floor, with its high, open-beamed ceiling, you'll find the living room with open kitchen (including a dishwasher). At the back, double doors open onto a French balcony. At the front, sliding doors lead from the kitchen to a roof terrace with built-in barbecue. 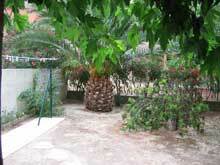 From this patio you can see the blue Mediterranean Sea beyond the trees in the nearby park. This roomy studio has a bathroom with shower, washbasin and toilet, and a separate kitchen/dining room with a door to the garden on the south, where you can enjoy breakfast or dinner under the bouganvillea. The beach is only 300 meters from the front door.